Heating your home can be an expensive venture. Utility bills, second only to rent or mortgage payments, can eat up your monthly salary. Many times, this is because you use more heat than you need with central heating systems. A space heater, on the other hand, can be a cheaper and more efficient way to heat only the room you are using at the moment, saving you money on your electric bill. Heating your home can be an expensive venture. Utility bills, second only to rent or mortgage payments, can eat up your monthly salary. Many times, this is because you use more heat than you need with central heating systems. A space heater, on the other hand, can be a cheaper and more efficient way to heat only the room you are using at the moment, saving you money on your electric bill. A space heater is a heating unit that produces warmth for a small area as opposed to central heating systems, which cycle warmth throughout an entire structure. Space heaters are typically electric; they are plugged into wall outlets or run on batteries. They come in two main types: convection heaters and radiant heaters. Convection heaters produce heat for an entire area whereas radiant heaters direct the warmth from the heater in a specific direction. Ceramic heaters are typically electric heaters but sometimes can use other types of fuel (such as propane) to produce heat. 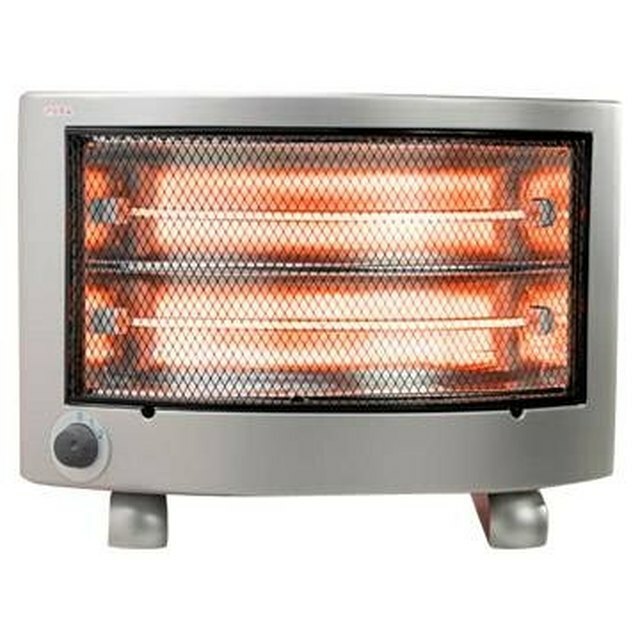 Unlike other electric heaters, a ceramic heater reflects the energy produced by the electricity or fuel between many different reflectors within the device, heating ceramic plates that produce heat, which is blown through a fan into a room. Because of their construction, ceramic heaters are more energy efficient than other electric heaters, cutting down on electric bills. Electric heaters use electricity to heat up metal coils within the machine, which then give off warmth. Some also use quartz rods to produce the same effect. Electric heaters are generally less efficient and thus more expensive than operating ceramic heaters. They can also carry some hazards. Metal coil electric heaters can grow very hot to the touch and even start fires. Ceramic heaters, on the other hand, are generally cooler to the touch during operation. Electric heaters come in a variety of types, and the cost of a space heating unit depends on which type of heater you are buying. Ceramic heaters can cost anywhere from $30 to $60, as of June 2011, while convection heaters can cost anywhere from $15 to $100. Radiant electric heaters run anywhere from $30 to $100. Cost largely depends on the model you buy and the manufacturer. Purchasing a well-made electric heater is essential; shoddily-made heaters can pose increased safety risks. How Does a Towel Warming Rack Work?